Bill took me to Sandy Pond on Lake Ontario. We unloaded our gear, walked to the middle of the lake, set up an ice shed, and drilled a few holes. As soon as we dropped our lines in the water, we started catching yellow perch, sometimes two at time! All this in the comfort of our heated shed, pretty much all day long, with the longest lull not exceeding 30 or 45 minutes. So what did I do wrong when I was fishing on my own? My line was rigged a bit differently, but I was using the right lures and minnows, so there should have been at least one perch stupid enough to bite anyway. Bill says that the sonar tends to scare perch in shallow water — so much for expensive electronics. I think that most importantly, you either know where the fish are or you don’t. Bill didn’t stop at a random point on the lake and didn’t need to spend his time studying lake contour maps; he knew exactly where he was going, even though there weren’t any other fishermen in a 100-foot radius. But Bill has an advantage: he lives and guides there year-round. 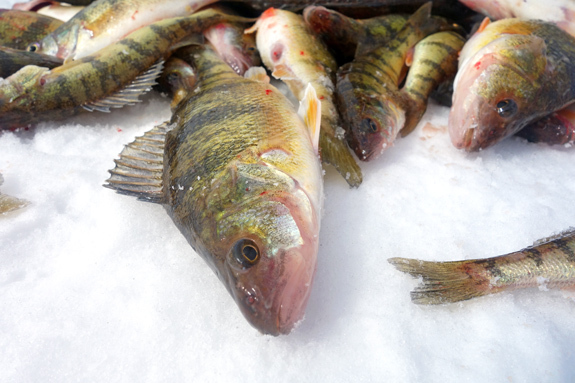 Although yellow perch has a pleasant, delicate taste, it’s rarely available in stores or restaurants. I suspect the reason is that it’s a hell of a lot of work to clean. 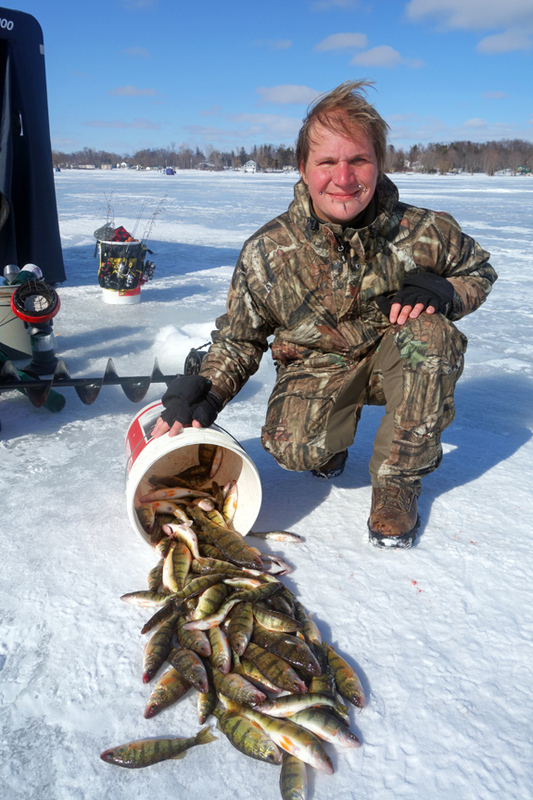 A large 12″ perch yields less than 4 oz of cleaned fillets. If you have a smaller specimen, you’re better off just gutting and scaling it. Then there are the bones, which you won’t be able to remove completely. They shouldn’t be too noticeable after the fish is cooked, but there will surely be some. Finally, due to the time of year, I got a massive quantity of eggs. In fact, the roe often outweighed the fillets in many females! Perch roe may not be sturgeon caviar, but it’s enjoyable enough and it takes only 10 minutes to prepare. I wanted to create a recipe that takes care of both the big perch and the small ones, without being too complicated (Eastern European fish recipes are usually dead simple, and preferably use lots of oil). The large fish are filleted and gently pan-fried in butter, while the small ones are dredged in flour and deep-fried whole. In retrospect, perhaps I should have let the juniors go and just used minnows or whitebait, which you can eat in one bite, head and tail on, without worrying about the bones. I also generally like the idea of having more of the food chain on the same plate. The cabbage side is great for people who don’t even like cabbage all that much, such as myself. Forget about unappetizing boiled cabbage that stinks up your kitchen for a week. This one is a vibrant green and tastes really good! Place the water and salt in a blender, and process until the salt has fully dissolved. Transfer the water to a bowl, add the perch roe, and brine for 7 minutes, whisking occasionally. Drain in a chinois for about 5 minutes. Store in a plastic container, and refrigerate. In a small saucepan over medium heat, brown the butter, then add the onion and sauté until soft. Reserve. Blanch the cabbage leaves in salted boiling water, then shock in ice water. Blanch the baby spinach in the same boiling water, then reserve. Transfer the onion, spinach, and half of the cabbage to a blender, and process until smooth. Transfer to a plastic container, and refrigerate. Finely slice the rest of the cabbage, and refrigerate. Toast the baguette slices until golden brown. Spread the butter on the toasts, then generously top with perch roe. Drizzle with lemon juice. In a deep-fryer, heat the canola oil to 375 F.
On the bottom of each cherry tomato, make a small cross-mark with a knife, and then deep-fry until the skins turn brown. Remove from the oil, and pull the skins from the flesh but keep them attached (check the picture above to see what I mean). 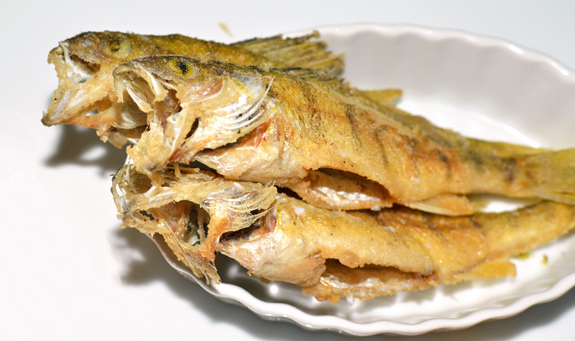 Season the small perch with salt, then coat in Wondra flour. Deep-fry until the skins turn golden brown, then drain on paper towels. Melt half of the butter in a non-stick pan over medium heat. Season the perch fillets with salt and pepper, and quickly sear on both sides, until just cooked. In a small saucepan over medium heat, sauté the blanched cabbage in the rest of the butter. Reheat the cabbage purée over low heat. On each plate, spoon some of the cabbage purée, top with some of the sautéed cabbage, and garnish with 3 tomatoes. Arrange 3 pan-fried fillets next to 3 deep-fried fish and a slice of perch roe toast. OMG,,,I didn’t see this my favorite fish 100 years,its exactly same like in Moldova,where I grew up I loved this fish,we did a lot of different dishes with fish,,I cant tell you how I wanna try it again,,yummy recipes,,you are awesome,good job..
Hi mrcarrothead, you’re right about canola oil, an American invention. I use it because it’s widely available where I live, it doesn’t impart any flavor to the food, and it has a high smoke point. There are several other options — in fact, I regularly use extra light olive oil too.